Day 1 - This soon to be 1400 mile journey started a little frenzied, I must admit. We were going to leave on Saturday, then at the last minute, found out that Maynard wanted to leave on Friday. I had it off from work, as it was going to be my prep day. Well, now I just had to throw all my gear together in a pile and hope it was all complete. My flies stayed in their prescription bottles instead of being neatly arranged in the new fly box that I had ready to go. No time to buy any new clothes for the trip. My two pairs of shirts and pants would have to do. Montana was waiting! And I was not going to delay the departure... We met up with a friend of mine, Peggy Sue. She had taken a fly fishing class with me and we wanted to experience the Firehole River. 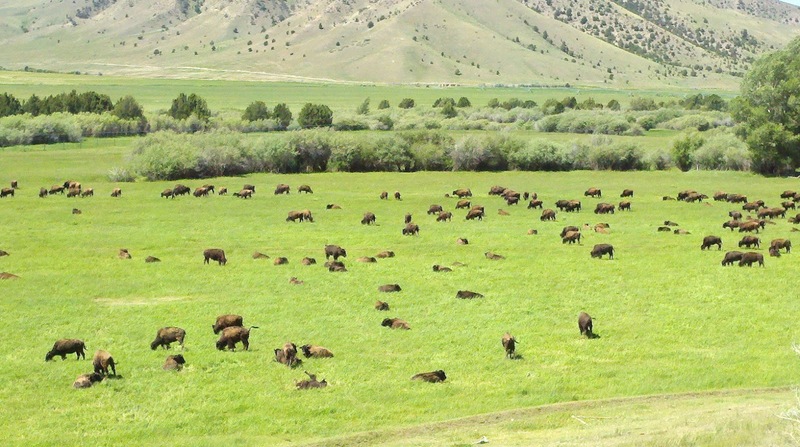 It is both of our favorites in Yellowstone. So, we were off! 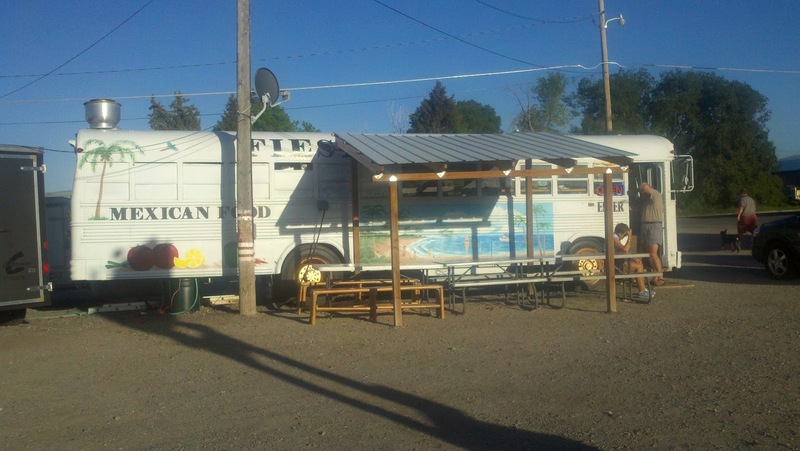 Along the way, it was sandwich time at the Mountain Market in Island Park, ID. And greatest homemade mustard! (I brought some home) Thanks, Dione! This was a forest of pines that we would have to walk through to the river. Yeah, RD in a forest with BEARS! My first time loading up with a can of bear spray.... Why wasn't I feeling much better? Maynard assured me that the probability was small that we would run into one. Peggy Sue just laughed...Why was she laughing? 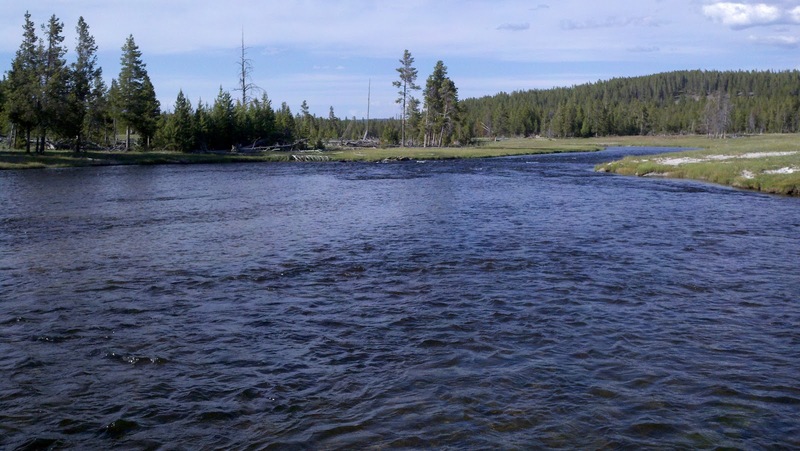 We finally found the river after about a 2 1/2 mi. 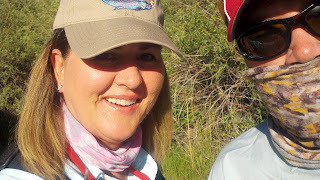 trek in... We gave it our best shot for a couple of hours, but it was fishing rather slow. We were back on the road again...back to West Yellowstone. 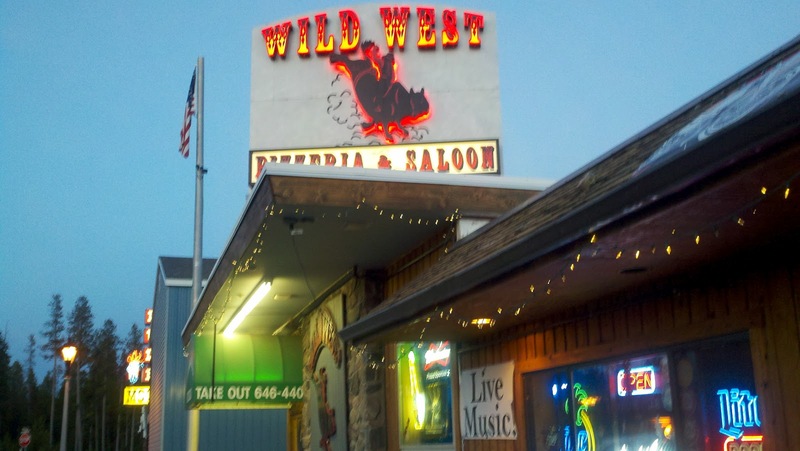 We would meet Ernie and have a pizza at my favorite place in town...Wild West. There was some kind of country/blue grass band playing and the place was lively. A good time. Oh, did I mention that if you go with fly shop guys...you might get a white pizza with artichoke and tomatoes? Hmmm... Maynard wasn't thrilled. To forget that he didn't get meat on his pizza...he started dancing some kind of watusi dance!!! 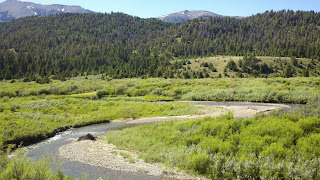 Day 2 - We headed out towards the Madison River. Lions Bridge seemed to be somewhere that we could have a rest stop and I could throw a few casts in for just twenty minutes. Back in the truck and on to Ennis, Mt. (Pronounced Eh-nis) Ok...I confess, I went with the long E and was quickly corrected, by Maynard. 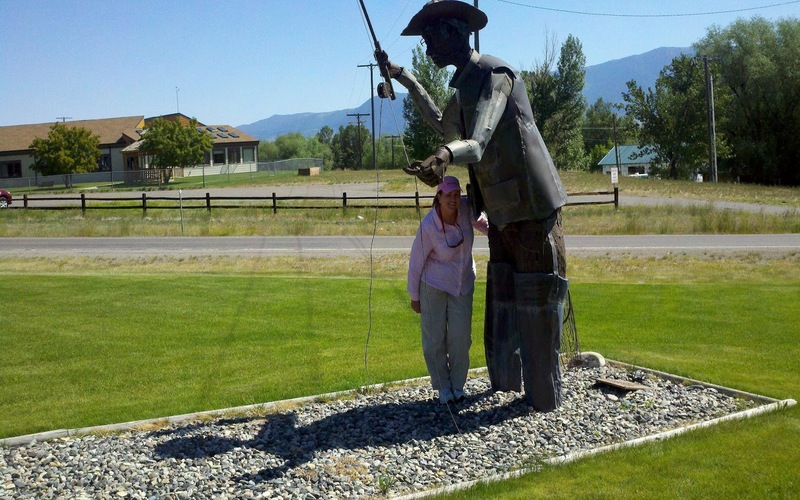 I loved being greeted by none other than an iron fly fisherman in the middle of town! (He's got a trout at the other end of the gravel box) My guess is that Lewis & Clark probably came through here on there expedition. A very quaint town. We drive a little further and we get to Virginia City, Mt. 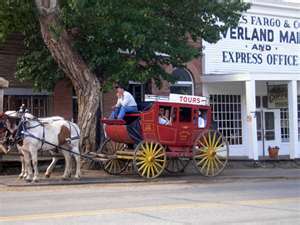 It has stagecoach tours waiting for visitors along side the old, western style main street. A boom town during the gold rush, they have kept all the shops in tact for tourism. Half of the structures were built before 1900. Didn't have time to stop, but someday it would be fun to go in and look around a bit. 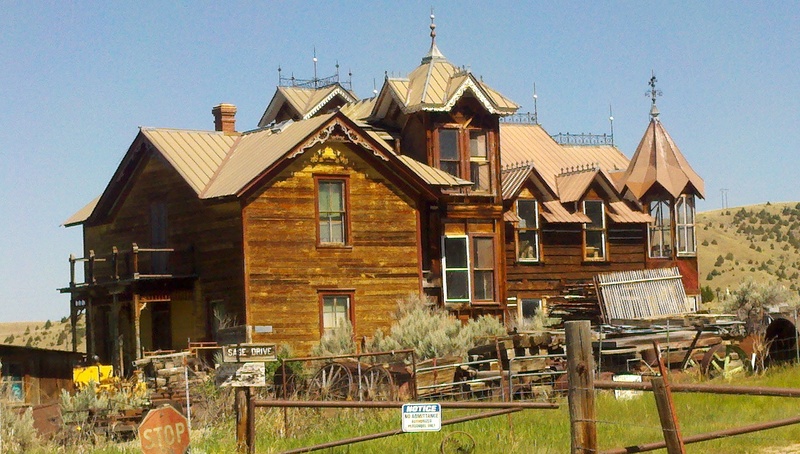 It's a fun, little ghost town and even Calamity Jane lived here for awhile! 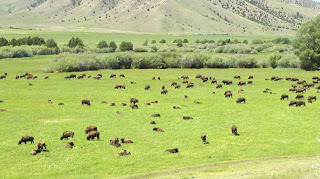 Now, we find the land of fly fishing (And a few buffalo!) 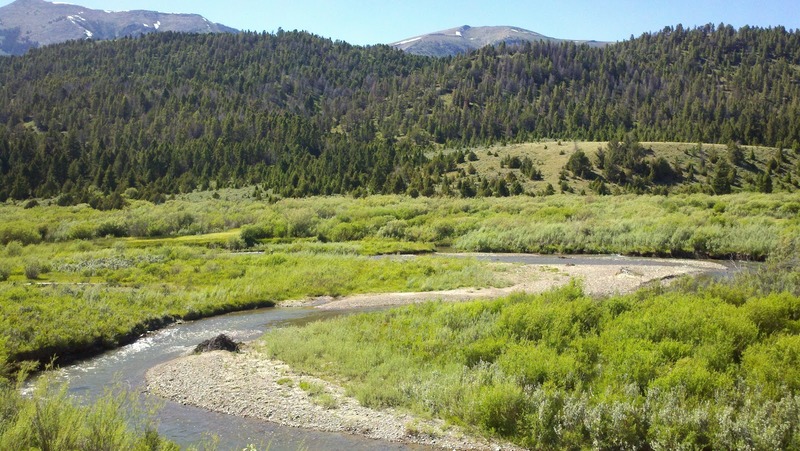 As we entered into the Alder Gulch and Ruby River Valley...it was breathtaking. A beautiful valley of hills and trees. Maynard had a great idea of putting us on Fluvial Arctic Grayling (Thymallus Arcticus) in the Ruby River... 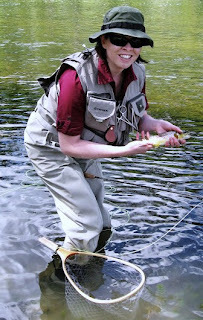 I have always wanted to see a grayling, up close and personal. 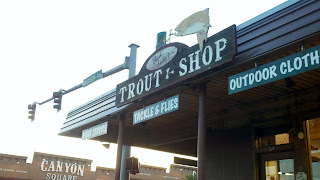 This was one of the "extra perks" on having Maynard drive...he knew the spots that had all different species of trout. I was into my casting about 3-4 times...and "fish on"! 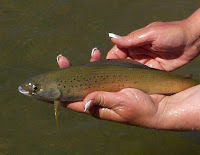 Something deep below started to rise from the water...it was greyish looking...so I knew it wasn't a brown trout! I didn't look like a rainbow either...Could it be??? I screamed over to Maynard and said..."Is this it?" He replied, "Looks like an Arctic Grayling!" Maynard... 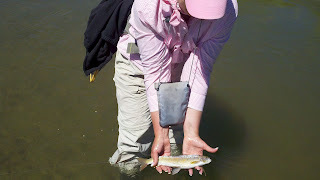 Showing me how to hold a Fluvial Arctic Grayling...top dorsal fin up! Who is this guy??? Can Frandito Bandito catch more fish in half the time??? NEXT UP: Ernie finds his way out of the flyshop, finally... Late at night, he journeys across mountains and streams, and fortunately avoiding deer contact...arrives to fish with us the next day. Now, our adventure will have a few extra kicks in it! Peggy Sue and I better be ready to keep up the pace! You can bet that we will give it our all... BIG FISH are on the horizon! Montana... Got to love it. I really enjoyed this post! And don't worry - that's no bear claw print. LOL Great write up! Wild west was tasty this year... Love that place missing it already although I am more in love with the still waters than the rivers. Never thought I would hear myself saying that 5 years ago! 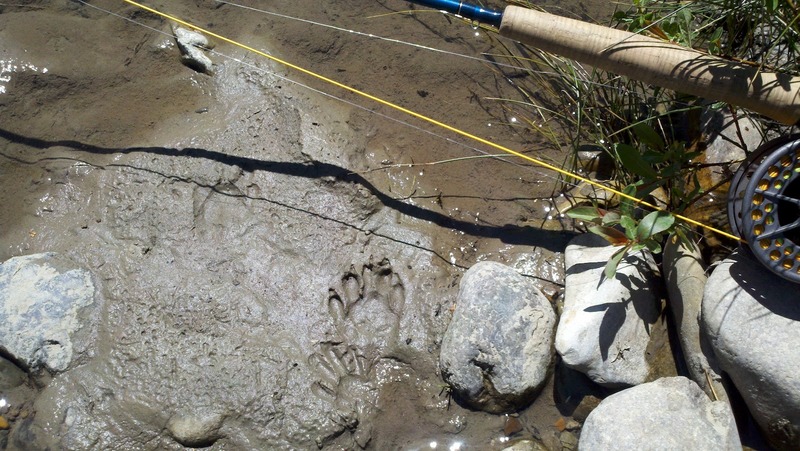 Craig ~ Glad you found some places to fish after finding the Slough too muddy! And yes, Henry's Lake can make you love still water even more. Your post made me chuckle. I can identify with wondering if bears will pop out behind trees in the middle of no-where. Seeing them run across a meadow is better. Nice job pulling up the graylings too! Hey Emily. 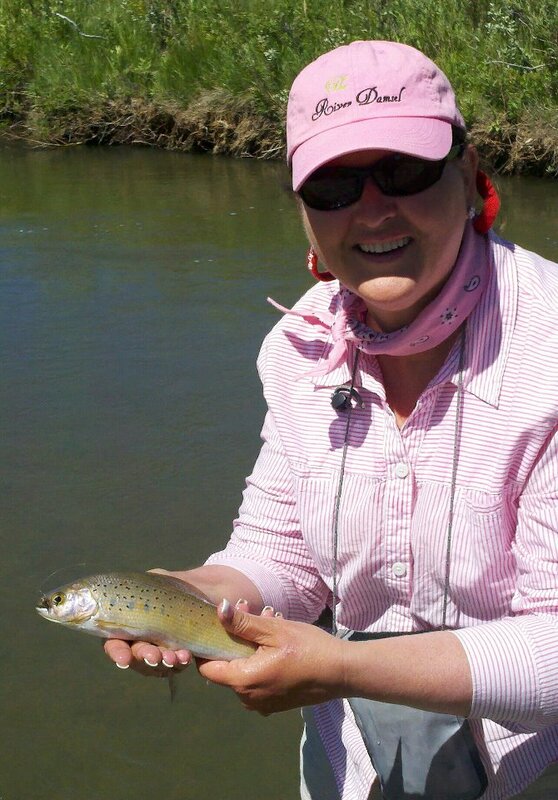 A great two day tour of Montana. 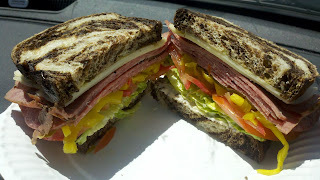 And that sandwich, wow what a way to start the trip. I hope it was as good as it looked. Can't wait for the rest of the story. Mark ~ Is that you? = ) I would have shared my sandwich...it was way big! The secret mustard is unbelievable... Looks like "Sunday Tippets" will have to move over for Part II... Hopefully, I can get the last 3 days into one post! There was a lot of fishing. Yes, that's the real me. Mark Kautz formally known as Shoreman. Wow, epic trip! 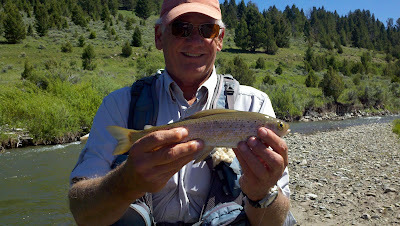 Congrats on the Grayling. Very pretty fish. Steve ~ We have barely scratched the surface of this trip. Haha. Looking forward to future, juicy installments. Part one sounds like a great trip so far, and a new fish. That's awesome. Looking forward to part two.